Rumors about pine and cedar as small animal litter are all over the internet. Sites are reprinting and repeating information taken from two specific articles that pronounce pine and cedar shavings toxic. But ... does Science beg to differ? Read on to discover the truth about cedar and pine shavings. This is a fairly long page - so we want you to know up front that pine shavings are just fine for rabbit litter, the nest box, and bedding. Pine is completely safe, and especially if it is heat-treated or kiln-dried. Learn the scoop about Cedar Shavings here. Laboratories that do drug tests on rabbits are the ones avoiding softwood shavings. This is in order to keep their results standardized between facilities. For pet rabbits and show rabbits, pine is completely safe for rabbit litter, especially kiln-dried pine. Kiln-dried pine is also the cheapest rabbit litter on the market. And since it does a comparable job to all the other litters, pine shavings as rabbit litter and rabbit bedding gets our top vote. 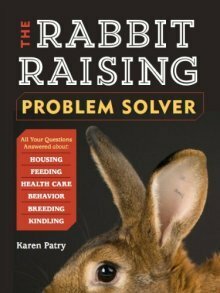 See Rabbit Bedding for comparisons with several other rabbit bedding materials, and more recommendations. Two online articles have almost singlehandedly destroyed the reputation of pine shavings for rabbit litter. This is unfortunate, as wrong conclusions have been drawn and then presented as fact. We’ll link you the the two articles (by Dr. Flentke and Ms. Merriman) and outline their views, while including our comments and observations for clarification. We’ll also give you the much more balanced comments of Lianne McLeod, DVM, who served as rabbit expert on Ask.com. Plus, in our Conclusion below, we’ll link you to our synopsis of a very informative article that correctly presents and interprets the misunderstood science. The body detoxifies phenols in the liver. This process is known to elevate the rabbit’s liver enzymes. Drug effectiveness when liver enzymes are elevated is reduced by over 40%, because the increased levels of liver enzymes washed the drugs out of the system much more quickly than normal. This is the main objection to softwood litters. An increased risk of cancer is currently talked about, but not proven. Evidence is suggestive at best (extrapolated from considerations in humans). DON’T use Ponderosa Pine needles as an alternative. In other domestic animal species, including cattle, they have caused spontaneous abortions and other hormonal disturbances. Ms. Harriman states that rabbits with liver disease died because the liver could not eliminate toxins from the blood. "Liver damage," she states, is caused by cedar or pine fumes, and results in a "large number of deaths due to liver damage and anesthesia fatalities." If using shavings, ensure your litter box is well-ventilated, and obtain blood work every few months. Studies of laboratory animals have shown fairly dramatic changes in liver enzymes on animals housed on cedar bedding. This in turn can affect the metabolism of drugs. [This is the only concern noted, and she references only cedar, while noting later that pine emits volatile oils but no clear conclusions can be drawn about pine. Our Pine Shavings page explains the normal, healthy, daily liver enzyme fluctuations.] Still, not much info on a direct link between these changes and disease or clinical symptoms. Pine - heat-treating pine shavings may reduce the levels of aromatic hydrocarbons. Kiln-dried pine is considered safe. Many pet products are heat treated. 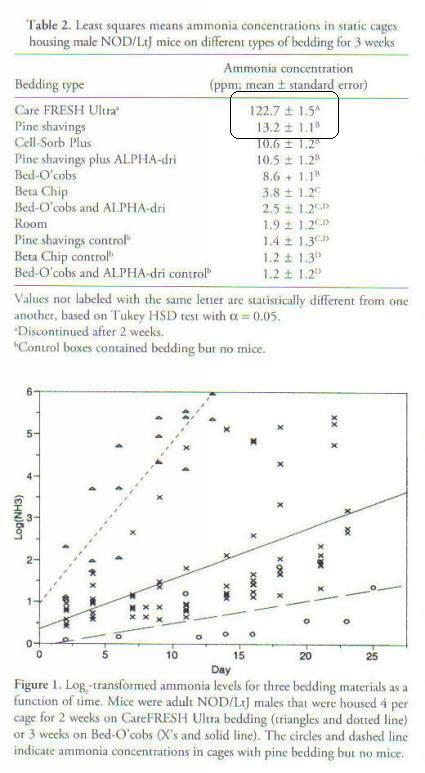 [Yes...10 times higher than its next-highest competitor - pine shavings (see Table 2 above). See our CareFRESH Pet Bedding page for our evaluation of CareFRESH. This Aspen Bedding is Available in 4 Sizes. Aspen is a hardwood. It looks like pine, but is harder and possibly less comfortable for animals. My comments in green above are drawn partially from my Registered Nursing training and experience, and from an excellent article written by Ms. Corinne Fayo entitled "The Truth About Pine Shavings." Ms. Fayo did all the research, and granted us permission to write a synopsis of her work which can be found here: Pine Shavings. Pine is an ideal bedding and litter product, superior to both cedar and CareFresh, cheaper than hardwood beddings, while being essentially equal in quality to hardwoods and other excellent rabbit litter products. What's not to like about pine?! We do recommend heat-treated pine shavings for rabbit litter. We've used it in our nest-boxes for over 30 years. If this practice were toxic, we’d have seen significant health problems with very young kits. This has not been the case. We know that some folks will still be afraid to trust the science, and that’s okay. But if you’ve read this far, perhaps we have laid your rabbit litter concerns to rest. Hopefully so!